Of all the games played, none has brought Jammu and Kashmir state so many laurels as Thang-Ta, a traditional Manipuri games of swords popular in many countries across the globe. However, the upcoming world championship at South Korea is the biggest test of players’ abilities, Umer Beigh reports. Players of JKTTA posing for a photograph after their historic win in Jharkhand. Out of the eight Asian teams at the recent First Asian Thang-Ta Championship held in Dhanbad, Jharkhand, in which teams of Singapore, Bangladesh, Malaysia, Afghanistan and Nepal participated, the players of Jammu and Kashmir state won laurels for Team India. These players were selected after they grabbed 36 medals in the Federation Thang-Ta Championship held at same venue from April 21 to April 22. It was for the first time in 2012 that J&K hosted 19th National Thang-Ta Championship where around 1200 players of 24 states participated. 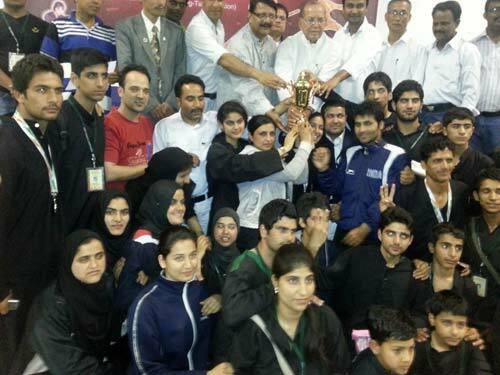 A milestone was achieved at the champonship when J&K was declared as the overall winner of the national title with maximum medals won in the competition. Thang-Ta is a traditional Indian ‘Manipuri’ game with Thang meaning ‘Sword’ and Ta, ‘Shield’. This ancient battlefield martial art in Jammu and Kashmir has two disciplines – Style-1 (Simple Sword Battle with Shield) and Style-2 (Sword Battle with Kicks). The game is managed in the state by Jammu and Kashmir Thang-Ta Association (JKTTA) which was formed in 1997. Once it was given recognition in the state by State Sports Council in 2002, the going has been good so far. The game has appealed girls in particular with most of them finding it useful and important for their self-defense. Presently, there are around 2700 players from 12 districts associated with JKTTA. These districts manage separate classes to bring the talented players from different schools and colleges on a common platform. Every district level championship adds around 40-50 new medalist players to the association. JKTTA General Secretary Aijaz Ahmad Bhat assisted his team during the recent championships. He says there is no such game in Kashmir which has achieved such amazing results. “This is a proud moment. We compete with Delhi, Manipur, UP, MP, Haryana, Punjab, Pondicherry, Kerala, Uttrakhand, Maharashtra, Nagaland, Tripura and Chandigarh— the best Indian states during Federation Championship and won 28 medals in different categories,” he says. Girls have outshined boys. In fact, a J&K player Shagufta was the first girl to receive Black Belt status in Thang-Ta during 2010 Asian Games. Saima Mohidin, 18, a 12th class student at Amira Kadal Higher Secondary School, Srinagar is another girl who won Gold Medals at Federation Thang-Ta Championship and Asian Thang-Ta Championship. “First we thought the competition will be tough, that we might not get a chance to participate in Asian Championship. But each player from J&K bagged medals. It was exceptional. We performed at our best,” Saima, a resident of Bagh-e-Mahtab, Srinagar, says. Saima says she was thirteen years old when she participated in a district level competition. “It was first such experience at that moment. As a girl, I thought the game of this kind will be useful for my self-protection,” she says. Another girl, Tamajud Saif, 19, won Gold for Style-1 category in both the championships held in Jharkhand. A student of Islamia College, Srinagar, she says the training they got before the championship made the difference and became the reason for their good performance. “If we continue our hard work, we have high chances of setting new records in future championships,” Tamajud believes. Sajad Ahmad, 25, the senior-most Thang-Ta player of the state who hails from Kakapora, Pulwama, has been playing for J&K from past 12 years At the recent championship, he won bronze. “Thang-Ta was least popular then when I first started to play the game. Nobody used to play at that time. But now youth have high inclination towards it. Even girls find this game useful which is good,” Sajad says. However, the upcoming months are going to be crucial for the state as most important competitions will be happening. General Secretary Aijaz Ahmad Bhat says the World Thang-Ta Council will conduct International Thang-Ta Championship at South Korea from September 5 to September 10. “Our players will be participating in that championship. This is the major event after 2011 International Contingent where Malaysia, Sri Lanka, Nepal, United Kingdom, Bangladesh, India competed in Manipur,” he says. “It is a big opportunity. Achieving good results at international level should be our main focus,” Sajad says. Its sooo nice to see Kashmiri players winning medals. It shows that Kashmiris are not less in any thing from others, and hope government will provide them more and good facilities for Thang Ta and other games too.